The following is the first part of a sermon I preached in the summer of 2010 called, "Women Praying Allowed." Feel free to use this in your churches or personal use to further the kingdom, and also feel free to comment lovingly and directly with your opinions or questions in the comment area. The title of today's sermon is "Women Praying Allowed." I grew up in a church where women did not speak in our assemblies and many of you did, too. One night at my home church, we had a Sunday night singing. That's where anyone -- any boy or man -- could get up and lead a song and they did. The women, they could shout out song numbers. Some didn't take too kindly to these numerical outbursts by the women, but they tolerated it. One night, a woman who was new to our church and our traditions, she commenced to walk toward the front to lead a song. One of the youth was on the second row and he knew enough about our code of silence for women that when she walked past him on the aisle, that young man audibly said, "Uh-oh." To the credit of our home church, she sang the song, she led it and everybody -- a lot of people -- sang along and she finished. Afterwards, one of the ladies took her aside and told her a little bit more about our traditions. Believe it or not, over the centuries, since the early church, churches have had no uniform or unified view of the role of women leading in worship or leading the church. Because of certain interpretations of a few disputed passages in scripture, notably in the letters of Paul, many have learned a knee jerked "uh-oh" impulse when we talk about women leading in churches. Today, in our series, "Talking Back to God: Speaking Your Heart to God Through the Psalms," we're going to experience women praying out loud. We're going to look at three different psalms that were written by women. We're going to have to go outside of the actual "Book of Psalms" to find those, but there are, at least, three psalms written by women in the Bible. At the same time, we're going to tackle some teaching that we've talked about in classes and we have discussed informally, but in the 41-year history of Garnett, we haven't fully laid this out from the pulpit, a new examination and a biblical overview of the participation of women along with men in leadership in worship assemblies. But women led ministries and have led ministries for many years at Garnett. At Garnett, we have core beliefs, things like God and Christ and the Holy Spirit and, "We believe our faith in God is displayed in our love for each other." That's one of our core beliefs. But we also have Heritage Commitments. Those are things that we do not believe are salvation issues and, from time to time, these need to be re-examined. It's an important healthy part of what we ought to do. One of those Heritage Commitments is both men and women serve in positions of leadership. Only the roles of lead minister and shepherds are male-specific. That's what our documents, one our Heritage Commitments says. This does not limit women from praying, leading worship, speaking publicly in different settings. We do mission reports and various things. We do these often, but we still have that "uh-oh" response when it comes to women being in front and doing certain things, like leading prayers and leading in worship. We're going to take this one step at a time. We're going to take our Heritage Commitments, we're going to take those things, like preaching and shepherding off the table. We're not talking about those today. For those of you worried about that, breathe a sigh of relief. For those of you who want to hear more about that, that's a discussion we can have. 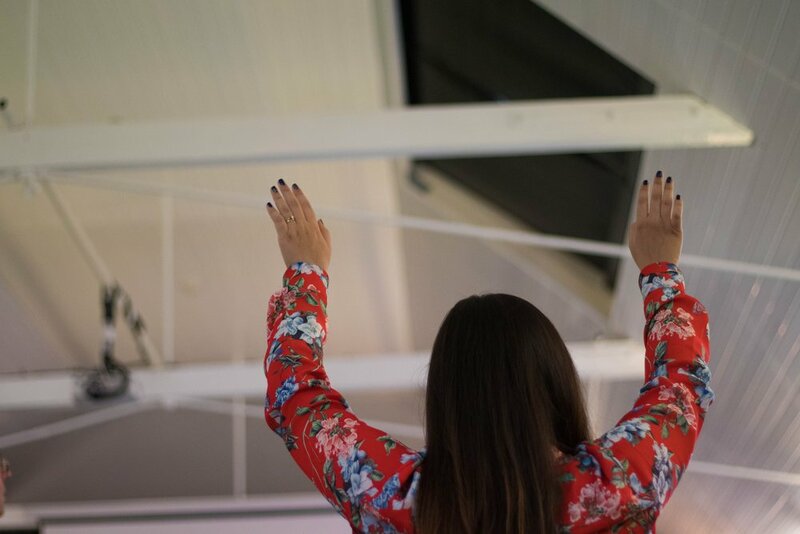 It's an open discussion, but for today, we're going to talk about women praying aloud in worship. It's incredibly important that we enter these discussions with humility and we stand on this holy ground that we just sang about. We believe in the Church as the body of Christ called into the world to love others and to spread the gospel of the love of God. We believe the Bible as God's Word to us in our only rule of faith and practice. Those are the Holy Grounds, the core beliefs that we stand on and it's important that we mention those. This is sacred ground for us, but our Heritage Commitments are something we should re-examine from time to time. Today, we're going to look at Women Praying Aloud. As we do that, we're going to use a prayer from Paul, in "Philippians 2:1-11" as our prayer, as we enter into this. "If you have any encouragement from being united with Christ, if any comfort from his love, if any fellowship with the Spirit, any tenderness and compassion, then make my joy complete by being like-minded, having the same love, being one in spirit and purpose. Therefore, God exalted him to the highest place and gave him the name that is above every name, that at the name of Jesus every knee should bow, in heaven and on earth and under the earth, and every tongue confess that Jesus Christ is Lord, to the glory of the Father." Amen. That passage speaks of the humility of Christ that we all, regardless of where we come from in this discussion, need to have. It's not humble for me to think that all of you will agree with me today, but can't you try? I don't expect you all to agree with me, in what I'm going to say today. Nor do I expect everyone to agree with me any day that I speak because full agreement is not the point. The unity that's spoken about and prayed for does not mean full agreement. It means standing on these core beliefs, bearing with one another, and hearing one another out. It's also not humble for you to cross your arms and refuse to hear another view, from God's Word today. Today, as always, we approach God's Words and we will look deeply into God's Word. That's what we do every Sunday and I encourage you to bring your Bible. We have great Bible classes, a new one by Beth Moore, John Heart's class, James Lawrence's class, all the students' and children's classes. We dig into the Bible in those classes and we dig in the Bible in our worship. I encourage you to bring your Bible. It's the Bible and people who have explained the Bible to me and have taught me, and people that have taught you. We hear God's Voice though the Word and through these people. I'm indebted to Mike Cope, Sara Barton, Scot McKnight, and many others who helped to open my eyes to new things in the Word, in particular, some of the things that we're going to talk about today. Remember that we come through different experiences in life and we need to hear our brothers and sisters. After we're finished today, I hope that you will not make a beeline to me with positive or negative, you can talk to me in time, email me, talk to me any time, but that you pay attention to your brothers and sisters, some that may struggle with what I'm going to say today, and that you'll go to them, first. We come from a lot of different angles. There's Lindy. Lindy was a missionary in the Bronx, in New York City. When she went to her supporting church to do a report, as she walked up to the stage to lead, when she got up to do her report, a family walked out just because she was a woman. There's Rayann. A woman who experienced a seven year old boy praying in the church assembly, in her church in Texas, and she wondered why a little boy can pray, when she, a mature Christian adult, could not. There's Judy, who hears people say, "Women's role, issue, is a salvation issue," and she's scared to move off traditional views, fearing for herself and her children, and her grandchildren. That if women's roles are expanded, they might spend eternity in hell. There's Duane, an elder who is caught between his wife, and his daughters, and a son with all different views on gender roles in the church, and can't agree. He feels caught in the middle. There's Donna, who for 40 years has been teaching Sunday school, and making her best dish for potlucks, and visiting the sick and widows, and praying. She takes these seriously, but she also takes some statements about expanding women's participation as offensive, because do her contributions not matter? There is Katy, she's a biblical studies major, who easily accept that there is some culturally limited, and temporary explanations for Paul's silence passages. She thinks the male dominated way we do things is weird, and even unjust. There's Robert, he feels that his marriage will come apart if mutuality and equality is discussed, and practiced in his home. Then there's Ida, who has spoken to us in our church twice when she was in the United States. Our Ugandan friend, Ida. She is the first to show up at funerals, cook, and help the family, grieve with them. She's a great song leader, speaker, and reader. Very spiritually gifted in these areas. And then a short-term missionary a few years ago took Ida aside, and told her that it was sinful for her to speak in front of the church. Then there's Kenneth, and he just gets mad every time the topic is brought up. There's our Garnett students, a few years ago, they helped to lead -- not lead even, but just to serve communion, and they were criticized to their face by some of our members. I don't know if those members are still here, but if you are here, I want you to think about that deeply, today. Then there's -- I think about my daughters. I have two daughters, and I have two sisters. In ways of spiritual formation, they're being raised in such different ways, and different times, but I deeply want them to be spiritually formed. All four of those women. My sisters, and my daughters, my wife, my mother. I think of all these women, and the need for them to be spiritually formed, and to be able to pray out loud, and be fully valued in the church. Today, we come from a lot of experiences, and we've sketched a few experiences, but it's important for us to look at scripture. That's our bread and butter. That's where we need to come from, and so we're going to look at a couple of kinds of passages in scripture, on women in ministry. Those two kinds of passages are these types. I'll just throw up this slide. WDWD and WKSB, that clears it up, right? The two different kinds of passages are, "What do women do?" in the Old Testament, and the New Testament? We're going to look at passages about what women do in the Old Testament, and New Testament. Then we're going to look at the "What women keep silent," passages in Paul's letters. It's important to look at both of these, and also to look doctrinal teachings beyond those. Let's go first to the Old Testament. What do women do in the Old Testament? Exodus 15:20. Do you remember Moses' sister who stood by hiding as Moses was put into a basket in the river? She watched Pharaoh's daughter take Moses out of the river. It was then that she approached Pharaoh's daughter, and then she went to get her mother. They ended up caring for Moses. From all indications, that was Miriam, Moses' older sister. If you look closer into that story. Then in Exodus 15. Miriam comes up again, and then in Numbers 12, speaks of Miriam. She is described in Exodus 15:20 as a prophetess, and credited with one of the oldest Psalmic lines in history, and that is this, "Sing to the Lord, for he is highly exalted. The horse and its rider, he is hurled into the sea." Sean spoke about those times in our life. Those markers when Psalms come out. For the Hebrew people, those markers were victories in battle. They were times of exile. That's when those Psalms would come out. This was a Psalm of victory Miriam helped to write, and she's credited along with Moses as writing. She leads the assembly in worship. Later Miriam and Aaron challenge their brother Moses, because they too were prophet leaders of Israel, but God was not pleased with them, and called them to the tent of meeting. God caused Miriam to become white as a sheet with leprosy, but this was not because she was a woman. It was because she disrespected, and dishonored God's anointed. God said, "I speak to Moses unlike I speak to any other prophet. I do that through dreams, and visions, but I speak to Moses face-to-face. You had the audacity to question him." As a special case, but it didn't have anything to do with Miriam being a woman, that she was punished. Later, Moses prayed for her, and she was healed. Another female prophet is named Huldah. How would like to have a name like Huldah. I hope nobody's named Huldah in here. There was a choice from Jeremiah, Nahum, Zephaniah, Habakkuk. He could have called any of these holy people, these prophets, but Josiah picked Huldah to come and interpret the law, and authenticate it. Which she did. We don't have time in this brief survey to mention leaders like Esther, and models of faith like Ruth, but we'll look at one more female prophet in the Old Testament, Deborah. Judges 4:4-9 describes Deborah as a prophetess that led Israel. Like Miriam, she is credited with a battle victory song in Judges 5. It's a little more -- It's pretty detailed. It's pretty graphic, what happens in that text, and in the Psalm. Writing Psalms, and singing is connected with prophecy, and influence in the Old Testament. What did women do in the Old Testament? They did many things, but we'll mention these. They spoke for God. They led the nation in all ways. They sanctioned scripture, guided Israel, prophesied, which is to say they preached. They led Israel back to ways of righteousness. They acted courageously and they risked their lives.